What is the Grants Management Process? What is the Grants Life Cycle? How to Find the Best Grants Management Software for Your Foundation? Though the grants management process can be tedious and long, grantmaking is often made more difficult than it is. An ideal process should help grantmakers positively impact the people and communities they serve all while benefiting the bottom line so the cycle of giving can continue. In any large process, there’s a period of feeling completely overwhelmed. It doesn’t matter how many times you’ve performed the tasks, how many people are working alongside or even how much motivation you begin with, simply starting can be an obstacle. Beginning the grants management process is one of those very instances, and once you get going, the complications don’t dissipate. The grants management process can be broken down into the grants life cycle, the multiple steps before and after the actual granting of the funds. For in-depth insight into these steps and actionable tips you can use within your own grants management process, download our 8 Facets of a Seamless Grantmaking Process. Enter your email and save the PDF for later. 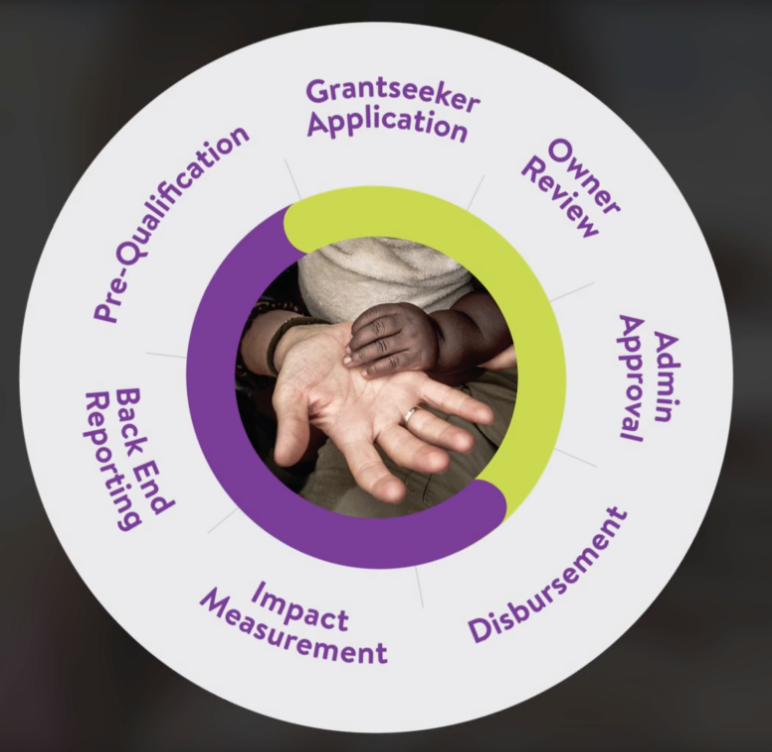 The grants lifecycle process can be timely from focusing on reporting, tracking applications, getting admin approvals and more. Fortunately, there are ways to help you so you can focus on the more important aspects like evaluating where your funds will truly make an impact. As the grantmaker you are planning and developing a funding program based on your mission, values, and company culture. Once you’ve created your program, you’ll formally announce the funding opportunity, you’ll be advertising to applicant communities and inviting proposals that fit your criteria. However, we do suggest you try advertising worldwide and in multiple languages. This way you can choose a cause anywhere in the world that would benefit the most from your grant and make the best impact. Completing an application may take grantseekers a long time--months even, because of how much information is required from them. But while these applications start pouring in, reviewing ALL of them a huge task in itself. However, since you might be receiving more than you thought, give applicants the option to self-select out. Also, have a pre-application questionnaire to help grantseekers determine if this is actually worth pursuing and if their values align with yours. Once all stakeholders have approved, the grant applicants will be notified of the award. As the grantmaker you should send out an award schedule including all upcoming deadlines and information required from the grantseeker. In the disbursement phrase, you’ll work with the award recipient to establish the legal framework for funding. Once that has been completed, the grant funds are disbursed. The way that happens may vary between organizations. For example, CyberGrants has several disbursement options. These include Comprehensive Charitable Management Services, Managed Account Services, and Flexible Account services, which provide grantmakers options to meet their objectives. After you have disbursed funds to an organization, you’ll want to collect data based on the results of your funding. Knowing the effectiveness of your funds and time can help inform future contributions. Grantseekers will need to conduct some paperwork on their end after receiving a grant. Two main types of reporting: financial and program reporting performance. These reports are given to the grantmaker to make sure all requirements are being met. Get specific insight into improving the grants life cycle. 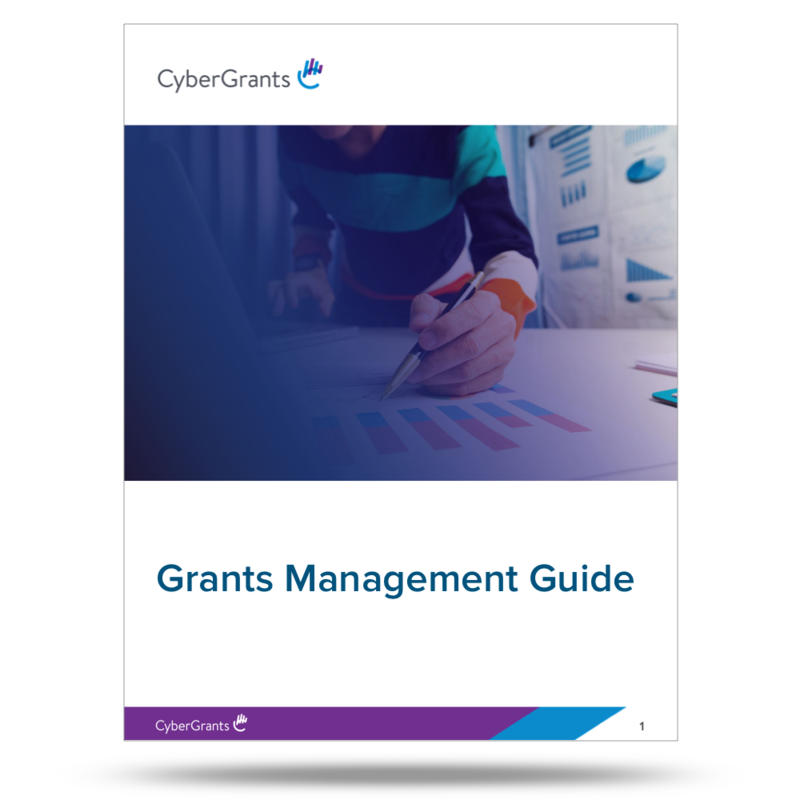 Grants Management Overview (GM page) from CyberGrants on Vimeo. Finding the right grants management system can be the gamechanger to grantmakers. Technology with crucial key features can increase efficiency and accuracy, however there’s a lot to consider when searching for the right one. How can you find the best grants management software for your foundation? What are the corporate philanthropy challenges you’re facing TODAY? Discover where your current process has holes so you know exactly what features you need. In order to purchase a grants management system, you need to know how much of the budget is dedicated to it. Don’t compromise. Make a list of needs and wants and refer to it often when you’re tempted to go for the lowest cost option or the grants management system with the flashiest marketing. Are you a corporate philanthropy team lead or is it just part of your everyday duties? Different organizations will need different features for their grants management. Research with ease of use “top of mind”. Take demos, ask sales reps and don’t be rushed into a decision. Make your decision. There are many grants management systems on the market today, find one who will act as an extension of your department. Get the full details into selecting the right grants management software. It’s not enough to write a check and a press release, nonprofits and foundations need to collaborate. It takes time and resources to approve these grants so it only makes sense to know your money is being put to good use and your getting some type of return on your investment. Our article on how foundations can better support nonprofits through grantmaking shows that 48% of nonprofits believe grantmakers don’t understand their needs. So, how can you make sure you are doing everything as the Grantor to make your Grantee feel like they are being fully taken care of and making sure your grant money isn’t being thrown into the wind? We pulled together some tips to help guide you through long term success with your grantees and your grant. Collaborate and collectively provide resources and transfer operational knowledge to all organizations you fund through a systematic process. This will eliminate any repeat work and helps your grantees receive the business knowledge they need to get the most out of your dollar. Be up-front with applicants to let them know that a formal assessment of additional needs will be conducted after the grant is awarded. This helps with two things: It gives nonprofits the reassurance that any additional needs they have may be considered and it provides transparent communication after the fact, so nonprofits aren’t left wondering if they will be accepted for a later grant. The relationship between the grantseekers and grantmakers is still very business focused and in order for either side to benefit from the enormous amount of resources involved, it is important to understand the needs and motivators of each.